» Episode 3: The Horror! The Horror! 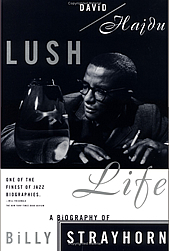 David Hajdu is the author of Lush Life: A Biography of Billy Strayhorn (1996) and Positively 4th Street: The Lives and Times of Joan Baez, Bob Dylan, Mimi Baez Fariña and Richard Fariña (2001), both of which were named finalists for the National Book Critics Circle Award. He writes a monthly column for The New Republic on music and popular culture, and has written for The American Scholar, The Atlantic Monthly, The New Yorker, The New York Review of Books, The New York Times Magazine, The New Times Book Review, and Vanity Fair, among other publications. He has previously taught at the University of Chicago and Syracuse University, and is now a professor at the Columbia University Graduate School of Journalism. He lives in Manhattan with his family. The Ten-Cent Plague: Weird tales, indeed; David Hajdu's History of the Comic-Book Panic. The Great Comic-Book Scare and How It Changed America]. Review: 'The Ten-Cent Plague' by David Hajdu. Also in Episode 3: The Horror! The Horror!